The recent detection of gravitational waves, as predicted by relativity theory, also tends to confirm that a period of rapid inflation of the volume of space occurred in the very early universe. The observation by a telescope at the South Pole indicates a spiral twisting of primordial light waves, as a result of an inflationary phase shortly after the Big Bang. This discovery is somewhat comparable to the detection of the Higgs boson, which has also been predicted by physical theories, but was until recently undetected. 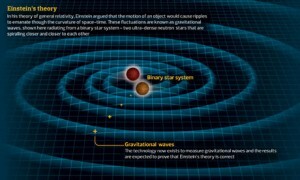 The gravitational wave discovery does not, however, resolve the problem of how it is that the laws of physics are exactly tuned to allow a universe that is capable of supporting life forms. If the strength of the four physical forces was even slightly different from what it is, the universe would probably resolve into either black holes or radiation, and not be life supporting. Inflation, as confirmed by the recent discovery, is often conjectured to have allowed the budding off of a huge or possibly infinite number of different universes, and to have thus created the proposed multiverse. Each universe has different physical laws, and given enough universes, it becomes inevitable that one of them will have the right laws for the evolution of stars, planets, life and eventually life intelligent enough to make observations about the universe. Rather conveniently, this resolves a problem in string theory which could otherwise be seen as unsatisfactory, because of 10^500 possible solutions to its equations. In a multiverse, however, these can all fit to universes with different physical laws. The suggestion is beguiling, but still fails to explain the opening phase of the Big Bang. The original energy of the Big Bang is sometimes claimed to arise from random fluctuations in the vacuum. However, this appears to assume the pre-existence of the kind of law-like vacuum, (really a plenum of virtual particles jumping in and out of existence), that exists and is governed by quantum laws in our universe. A true void, devoid of particles and forces, and ungoverned by physical laws does not appear to exist in our universe. A further problem is that inflation requires precise physical laws governing the existence and behaviour of inflaton particles prior to the coming into being of the multiverse. Further to this, inflation has been claimed to require a low level of initial entropy, the odds against which are even larger than the odds against the existing laws of physics arising from a single throw of the dice.